Region Sønderjylland–Schleswig is the regional centre for cross-border cooperation between the municipalities of Tønder, Aabenraa, Haderslev and Sønderborg, and regional council of southern Denmark, the districts Schleswig-Flensburg and Nordfriesland, plus the city of Flensburg. Region Sønderjylland–Schleswig's FDE building, August 2009. Region Sønderjylland–Schleswig was established on 16 September 1997 in Aabenraa. It is a recognized Euroregion, a legistrative cooperation between two or more European regions sharing a common border. All Euroregions are organised in the Association of European Border Regions with head domicile in Gronau. Just the coordinating centre for the cross border cooperation within Region Sønderjylland–Schleswig is for filled by the Regional Office in Padborg. Region Sønderjylland–Schleswig refers to the historical background, which the cross-border cooperation has. 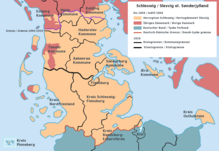 Both Schleswig and Sønderjylland have become two independent institutions which characterized the old Duchy of Schleswig that got divided in 1920 between Denmark and Germany. The southeastern part of Schleswig/Sønderjylland, which belongs to the German district of Rendsburg-Eckernförde, declined to become part of the cross-border cooperation. The co-operating partners of Region Sønderjylland–Schleswig are still subject to their own national legislations. At the same time the co-operation supports the European Charter for Border Regions and Cross-border regions that was carried out by the Association of European Border Regions in 1995. The foundation for the co-operation is based on equal rights and a mutual respect for the other side’s cultural peculiarity, and decisions are made in unanimity. The Regions administrative domicile is located where the partners decide to place the secretary of the organization. There are several different objectives for the cross-border cooperation. First of all, a wish for a broader demographic contact and cultural exchange between the two populations, which in turn should lead to a deeper mutual understanding and an increased knowledge of each culture and language in the longer term. In order to support this objective, Region Sønderjylland–Schleswig provides administrative and financial support for cultural projects, for example through the Interreg project “KulturDialog”, exchanging teachers, cross border school cooperation and various language projects are prioritized. There is also great focus on economic integration and interaction of the cross-border labour marked. Since 2004 the Infocenter, under Region Sønderjylland–Schleswig, has provided advice and counselling for cross-border commuters. The centre started as an Interreg project but became so popular, that it was permanently established in 2007. The Infocenter provides free advice and counselling both to the business community, local government and private individuals, wanting to expand job or living opportunities on the other side of the border. Here there is close cooperation with various other networks, for example trade unions, employment agencies, local authorities and clubs. Our internet page; Pendlerinfo, administered by the Regional Office thus offers information and help for commuters. Infocenter regularly hold lectures in conjunction with both Danish and German employment agencies and unemployment insurance representatives, in-service training of employees in the councils dealing with cross-border commuting, and give personal counselling. Region Sønderjylland–Schleswig is also active in voicing concerns specific to the border region. Region Sønderjylland–Schleswig has for example pointed out the need for mutual recognition of business educations. Also building projects of current interest like the Fehmarn Belt Bridge and general infrastructure within the border region has the attention of Region Sønderjylland–Schleswig. In order to support the cross-border business community there has also been some actual projects like the development of Danish-German parking discs and a pocket dictionary. The board consists of eight members. Chairman of the board is currently Hans Philip Tietje, Region Syddanmark. The responsibilities are many: the board prepares and carries out decisions and works closely together with the Regional Office. Furthermore, the board can appoint business groups for special assignments. Last but not least the board represents Region Sønderjylland–Schleswig interests in any public debate. Decisions are based on a majority of votes but unity is always the goal. The Regional Forum has one committee: Committee for Culture, Contact and Cooperation. Furthermore, there has been established several business interest groups. The Regional Office in Padborg is the coordinating centre for all Region Sønderjylland–Schleswig's activities. Political cooperation is coordinated and initiatives from political side are closely monitored. One current example is the initiative to improve the exchange of language teachers. The teaching of Danish in Germany is especially affected by this, because Danish-German exchange of teachers, which should be taken for granted, is difficult due to administrative differences in in-service training. The committee in cooperation with the Regional Office has just made an official enquiry to the ministry in Kiel. The expenses of the organization are curtailed by 50% to each the Danish and the German partners, excluding any grants from any side. All partners have full access to all financial information of the organization. The budget for 2012 is 5.7 million DKK. This page was last edited on 12 March 2017, at 09:10 (UTC).